I have tried my very best to not have multiple posts on the same destination but seems like I can't help but open another post on my upcoming trip to Seoul. There were lots of requests on Seoul itinerary and since I am planning a trip to Seoul with my mum soon, I thought I should dedicate a post on this. Usually if I am in Seoul visiting my bf, we don't prepare itinerary for obvious reasons. In addition, we usually drive around places so I don't really have much information on public transport. This time round is different as I will be travelling with my mum without my bf and doing all the touristy stuff. We are planning to have our haircut, perm and colour there (it has been a long time since Korea hair salon has been highly raved about but it took me years to finally visit one). In addition, my mum also intends to make another pair of glasses in Korea (which is significantly cheaper than in SG). It will be a relaxing trip and we will base ourselves in Myeong Dong. 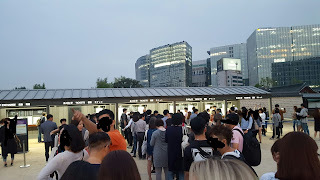 We intend to visit Express Bus terminal underground shopping (Goto mall and also the new Enter6), Naksan Park, Sky Park, Namsangol Hanok, Lotte supermarket, Namdaemun, Edae etc.